NEW ORLEANS – Passion is a motivator. Passion has the power to push people to move forward beyond expectations. It provides the drive and motivation to get up every day and charge at life. The service is built by passionate individuals who have chosen to take the challenge to serve. Arriving from all over the country they are placed in new locations, making a difference and changing the lives of all who surround them. 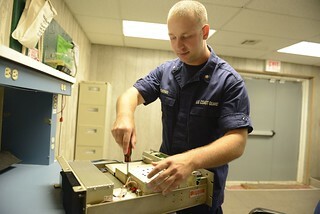 Petty Officer 3rd Class Derek Severns, a electronics technician at Coast Guard Communication Station New Orleans performs maintenance on equipment at Communication Station New Orleans, April 25, 2014. Native to Temecula, California, Severns found his passion for electronics while watching the work of Electrician’s mate during his time on the Coast Guard Cutter Alert in Astoria, Oregon. Severns’ job is to perform maintenance on a total of 15 transmitters, 17 receivers and 31 antennas that provide rapid, reliable and secure communications to the Coast Guard operational commanders, other governmental agencies and civilian organizations across the Gulf of Mexico. Severns takes upon collateral roles that are above his rank. He is the unit master-at-arms. His leadership has helped bridge the gap of missing personnel during a busy transfer season. The challenges that Severns seeks don’t stop at work. The passion Severns displays in his work life is equaled by the passion he displays in his off time. Severns likes to explore New Orleans, go on nature walks down through the bayous or local parks. He also enjoys running, trying out new food and is enamored by sports. During September of last year, Severns reached out and emailed a coach to ask if he could volunteer as a coach for the Belle Chase High School Junior Varsity baseball team. Severns used to play baseball growing up. He has always loved the sport and felt knowledgeable enough to fit the role. “I feel baseball is a critical-thinking game. You have to be one or two plays ahead,” said Severns. The students have since embraced Coach Severns methods and teachings within the sport. They can be seen giving their 100 percent without any hesitation. The season began with weight training and conditioning for the student athletes. Severns eventually came to the point where he attended daily. “Baseball keeps him pretty busy after work hours, I see him in his baseball uniform quite often at the end of the day ready to go,” said Chief Petty Officer Marco Lopez, executive petty officer of Communication Station New Orleans. With persistence and dedication Severns soon became the head junior varsity coach and one of the main assistants for the varsity baseball team. “I didn’t think I would get such a prominent role on the team and as much responsibility as I received,” said Severns. Severns has his passion for baseball. He is doing what he loves and parlays the volunteer service opportunity to mentor young students, assists them to discover their good sportsmanship qualities, on-the-field leadership qualities and overall being good teammates. “When he works on something, he is going to get it done, always finds a way to make it better than what is expected of him,” said Pate. 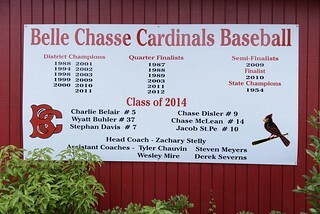 A board displaying the 2014 Belle Chase Cardinals Baseball Team Roster April 25, 2014. 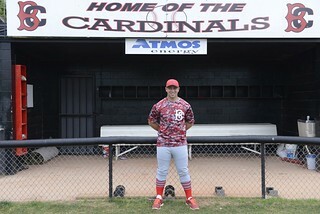 The Belle Chase Cardinals faced a tough season, with the junior varsity taking in three wins and six loses and the varsity team being knocked out of entering the playoffs. But through that trial and effort, each individual player gained new experience, growing and taking the steps to being better players and leaders. Though the season may be over Severns will continue to learn, his knowledge ever expanding and passion ever growing. “It is a good feeling to know that he is out there and doing a good job and setting a prime example for the Coast Guard,” said Pate. Severns will continue focusing on perfecting his trades at work and enroll to school to earn an electronics degree. “We go out, we practice, and we hit it hard,” said Severns. The Belle Chase Cardinals Baseball team will play another season, if transfer season permits, Severns will be right there alongside them once more.